When you are shopping in your local grocery store, you might notice that the eggs have different grades. An egg is graded based on the quality of its interior and the appearance of its shell. The higher the grade of an egg, the more expensive it is. The different grades of eggs range between AA, A and B. Rather than simply selecting the egg that best fits your budget, you can select the egg that is well suited for the dish you are preparing. Grade AA is the highest quality of eggs. For an egg to be certified as grade AA, it must have a thick, firm white. The yolk of a grade AA egg is round, stands up high and is free of almost all defects. The shell of a grade AA egg should be clean and presentable. 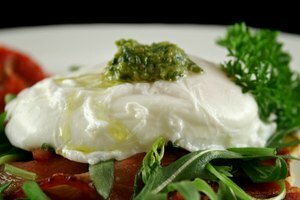 Grade AA eggs are ideal for poaching, frying and using for any dish in which appearance is important. Grade A eggs are the second highest quality of eggs and the type most commonly sold in grocery stores. The yolk of a grade A egg must meet the same standards as a grade AA, standing up high and free from defects. The white is the biggest difference between a grade A and AA egg. Grade A whites are slightly less thick and firm that grade AA whites. The shells of grade A eggs must be clean, although minor defects are accepted, unlike grade AA eggs. Grade A eggs are suitable for most any general baking or cooking need. Grade B eggs are the lowest quality of eggs available for purchase. Grade B eggs are rarely sold in stores and are commonly used for commercial liquid and powdered egg products. The white of a grade B egg is thin and watery. The yolk is wide and flat, holding a far less uniform shape than the yolks of grade AA and A eggs. The shells of grade B eggs must be unbroken, but they commonly have stains and noticeable defects. 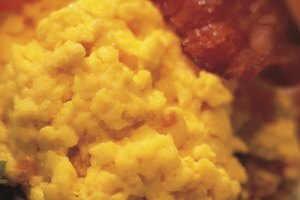 Grade B eggs are best used in baked goods, rather than fried, scrambled or poached eggs. For the purpose of sales, chicken eggs are also graded by size. Jumbo eggs have a mass of more than 2.5 oz. Extra large, or XL, eggs weight more than 2.25 oz. Large, or L, eggs have a mass greater than 2 oz., and medium, or M, eggs have a mass greater than 1.75 oz. Small, or S, eggs have a mass greater than 1.5 oz., and peewee eggs weigh more than 1.25 oz. How Long Does It Take to Poach an Egg in an Egg Poacher?